If I’m going all out for breakfast, I usually choose to make something sweet…pancakes, waffles, crepes, etc. The rest of my family, most of them being boys, usually wants something they can pour hot sauce over to show up on the table. So, over the years I have come to enjoy savory breakfasts as well. The best part? You can be pretty sure to find some sort of protein and vegetable in a savory breakfast dish, so it’s a more nutritious alternative to the syrup-soaked stack of pancakes. With it being autumn, I decided to make an autumn hash. 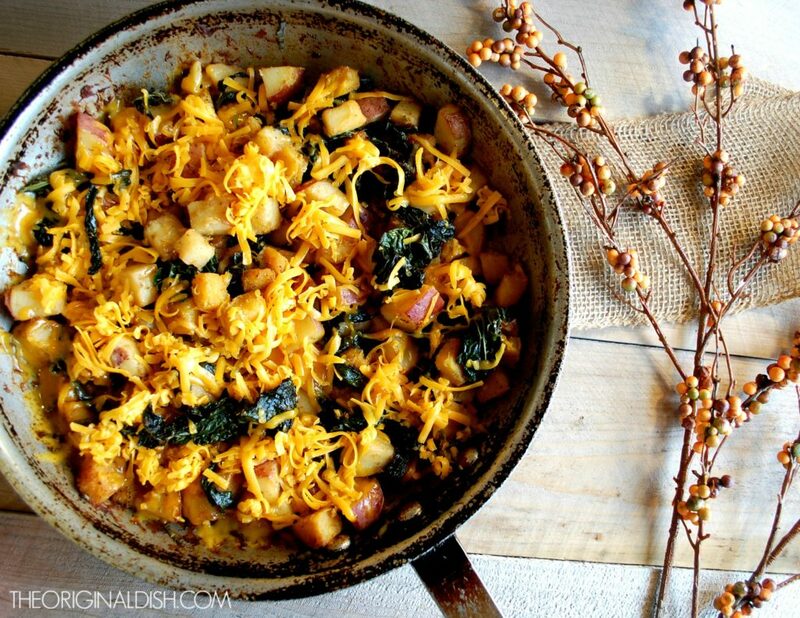 The hash starts simply with browning red potatoes and acorn squash. I like to start the vegetables in the sauté pan so they caramelize and hold their shape in the oven. 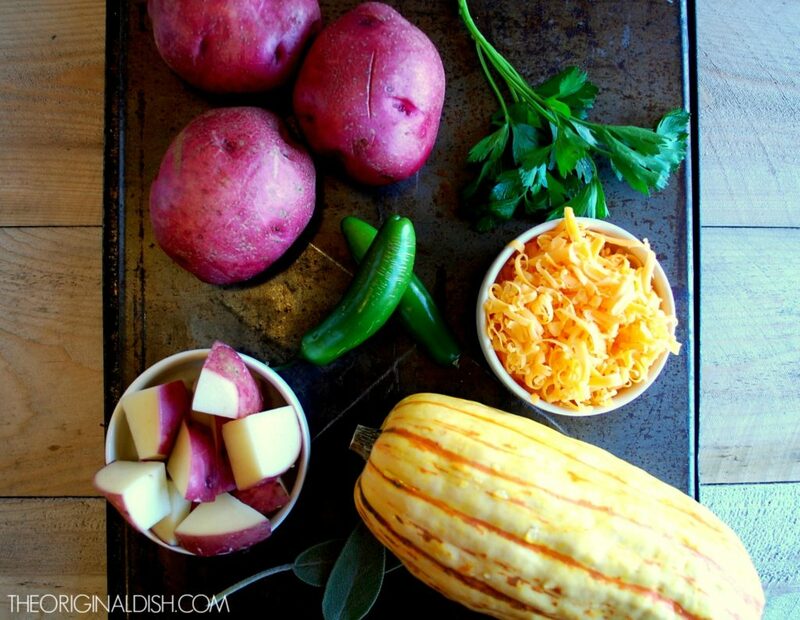 The potato adds a starchy component while the squash is delicately sweet. I use half of a Serrano pepper for some heat, but these peppers are fairly mild, so it’s not overpowering. The rest of the hash is extremely simple. I deglaze the pan with apple cider to continue the fall theme, and I add julienned sage leaves. Kale is slightly wilted down in the cider before I throw the entire pan into the oven. 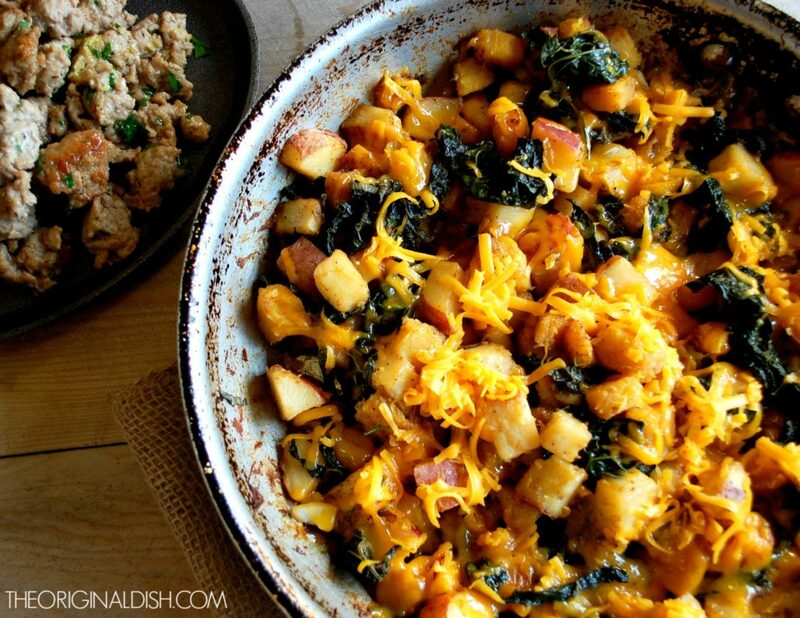 In just 20 minutes, the potatoes and squash are tender. The final step: melting tons of cheddar cheese over the top (I use sharp cheddar, but mild would be just fine). The recipe calls for 8 ounces of cheddar cheese, but by all means add double that if you like it extra cheesy. To go with this simple, yet flavorful hash, I needed a protein. 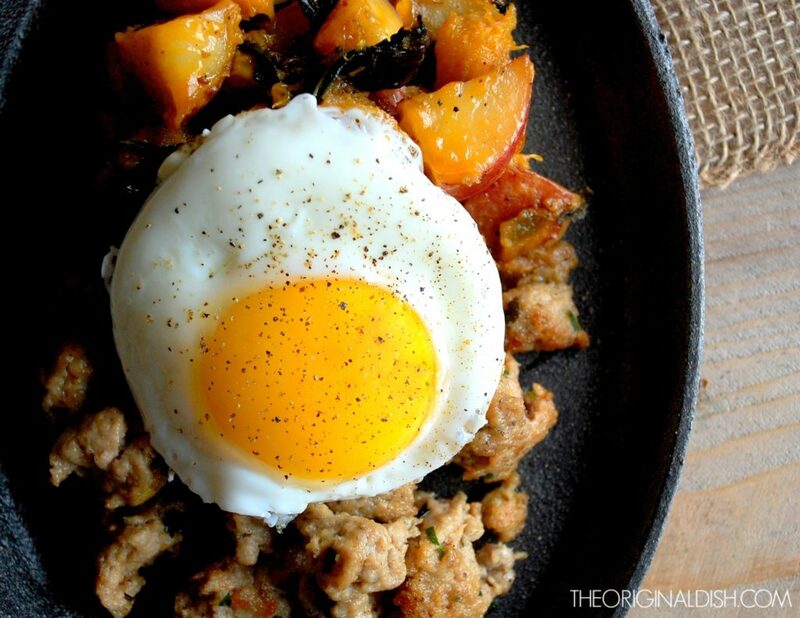 It was tempting to just throw some bacon in the oven and call it a day, but I saw a package of ground turkey at Whole Foods and figured it’d be a perfect pairing for the autumn hash. I season the meat simply with salt, pepper, and McCormick’s Herbes de Provence. The Herbes de Provence includes rosemary, marjoram, thyme, and savory. 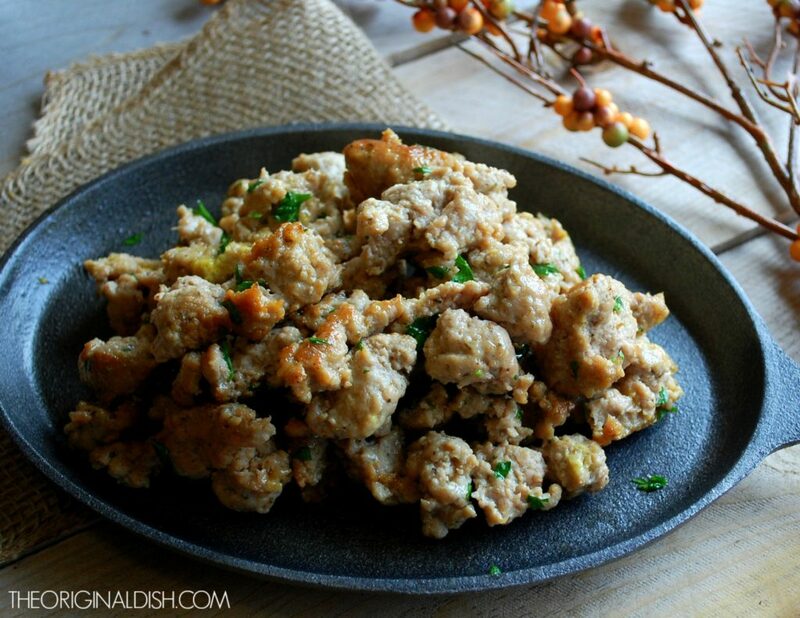 These herbs give the turkey the flavor of breakfast sausage. After the meat is seasoned, I form a little patty and test it by cooking it in hot oil. If the meat is seasoned properly, I continue to cook the rest. Since I don’t want the ground turkey to just crumble into little pieces, I start by browning the meat on both sides (I break it up into three large sections just so I’m able to flip each piece over easily). By browning it first, the meat will set up a bit. Then, I break it apart into medium-sized chunks. The result: hearty pieces of sausage that get tossed with fresh parsley. To round everything off, and since it is breakfast, I fry up some eggs. 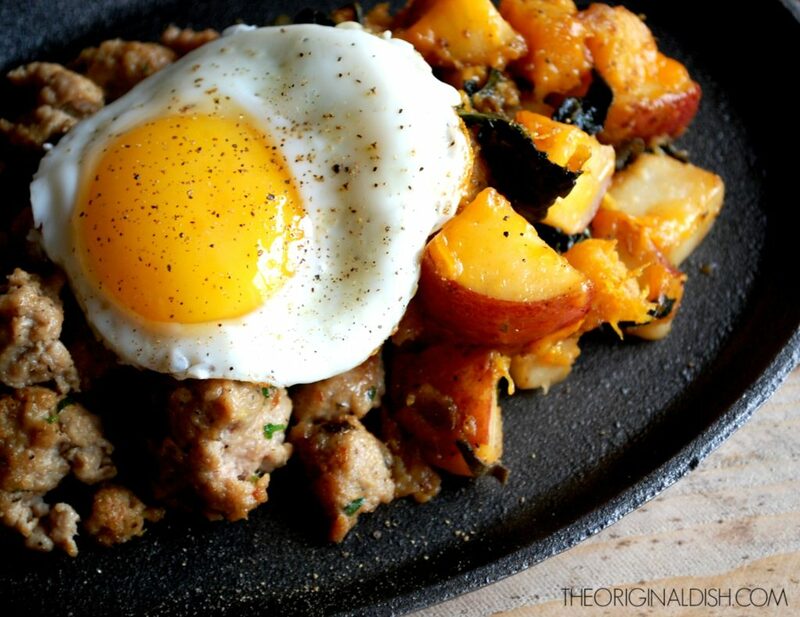 Each plate gets a mound of both the hash and the sausage, and gets topped with perfectly fried eggs. I like a runny yolk so it creates a silky “sauce” for the rest of the dish, but cook the eggs to your preferred doneness. Preheat the oven to 350°F. In a large sauté pan, heat the oil over medium-high heat. Add the potatoes, squash, Serrano pepper, and season with salt and pepper. Cook until the vegetables are browned, about 10 minutes, tossing the pan occasionally. Add the apple cider and sage. Let the cider reduce for a minute before adding the kale. Once the kale begins to wilt, transfer the pan to the oven and bake for 20 minutes. Season to taste. Add a generous amount of cheddar cheese over the top. Throw the pan back in the oven just until the cheese melts. In a large mixing bowl, combine the ground turkey, salt, pepper, and herbes de Provence. Using your hands, give the mixture a good massage until all of the ingredients are combined and the ground turkey is homogenous. Heat the oil over high heat. Add the turkey mixture to the pan and begin to brown on one side, breaking the meat apart into only a couple of pieces. Turn the pieces over and brown on the other side. When the meat is browned on both sides, break it apart even more into medium-sized pieces of sausage. Reduce the heat to medium-low and finish cooking until the turkey sausage is cooked through. Toss the fresh parsley in at the end. 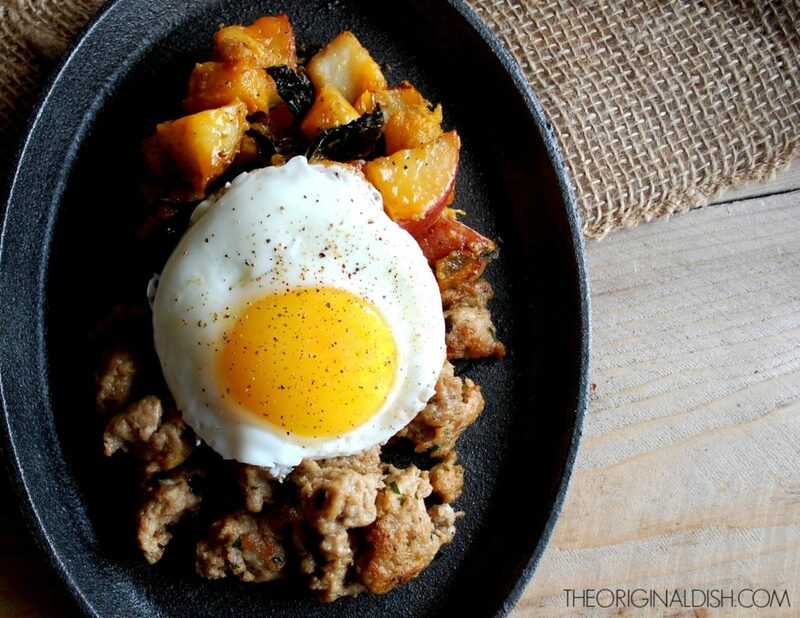 Serve each person a generous amount of both the hash and the turkey sausage. Top with the fried eggs. I made a similar hash last night, but let’s just say it wasn’t as healthy as this! 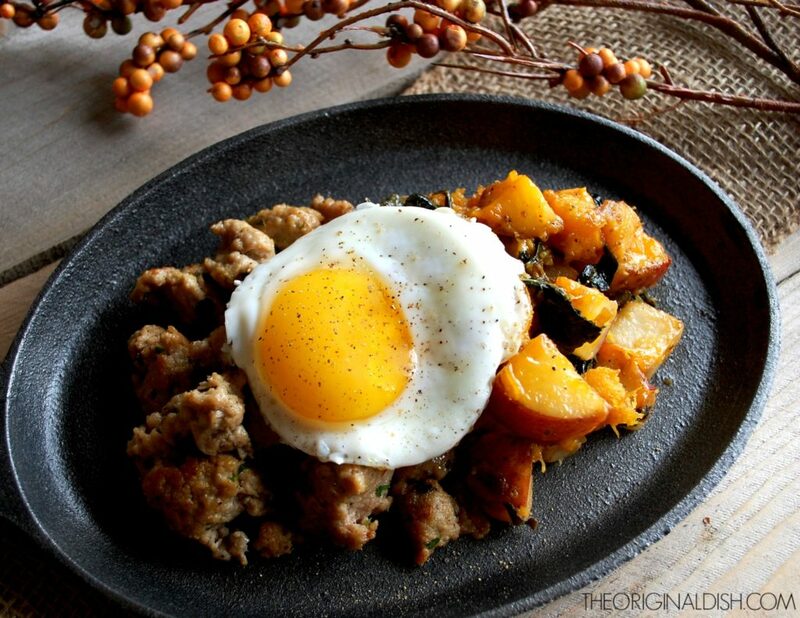 Love that you used turkey sausage and acorn squash!